It’s that time of year; a new Assassin’s Creed is nearly upon us. If you’re a fan of the series, like me, you’re probably pretty excited. In about six weeks we’ll get to check out what’s been cooking at Ubisoft Quebec. Let’s take a spoiler-free look at what we know. It takes place in London, in 1868. As you could probably tell from the picture at the top of this article, Syndicate takes place during the Victorian era, near the end of The Industrial Revolution. That means a lot of things, the first of which is that this will be the most technologically advanced Assassin’s Creed yet. For the first time we’ll inhabit a pretty familiar world. There will be trains and steamboats as well as factories and so on. Londoners might not have been enjoying air conditioning and wifi, but it’s distinctly more advanced than previous titles. You can play as two assassins. In a first for the series, Syndicate will give you two distinct assassins at your disposal: brother-sister duo Jacob and Evie Frye. Jacob and Evie take very different approaches, and (presumably) play quite differently. Jacob is more of a hand-to-hand brawler, and tends to do his work out in the open, where Evie is a more disciplined assassin, focused more on stealth than open combat. In a sense Jacob and Evie almost seems as though they’re personifications of the original game’s high and low profile modes. Evie seems by far the more interesting of the duo, as she has an ability to become invisible by standing in one place. You can switch between them on-the-fly. 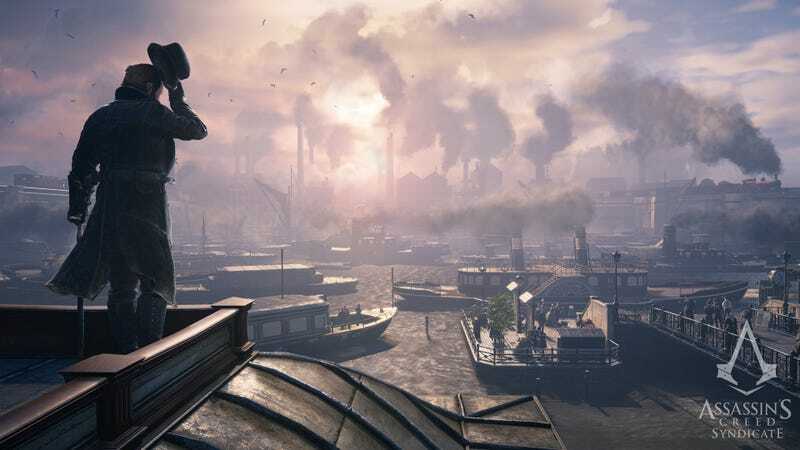 When you’re running around London in Syndicate, you have the choice of playing as either Jacob or Evie at any time. Certain story missions will require the use of one or the other, but any other activities can be done by either assassin. The process for switching between them hasn’t been shown off yet, but I doubt it’s much more than a simple button press. I’m sure that will be revealed as we get closer to launch. The assassins have a new gadget. What would an Assassin’s Creed game be without a new gadget? This time around we get the rope launcher. Think of it as a take on Batman’s grapple gun. Basically the rope launcher will let you vault up buildings more quickly, or even travel between them. The rope launcher works like this: If you’re within range of a wall or structure you can fire it at, a prompt will appear, when you fire your character will automatically ascend or zipline across. It’s a really cool way to keep from being discovered if you want to play that way. If you don’t, of course, there’s good news there too. Until last year, combat in Assassin’s Creed games hadn’t changed much. For some, that was a really bad thing (I still really enjoyed it). Unlike previous titles, Syndicate focuses much more on close-quarters, hand-to-hand combat, and as a result everything’s been retooled. Since a sword isn’t really your primary means of laying the smack down anymore, that wait-for-an-attack-and-parry rhythm is gone, and things are much more fluid as a result. Standing and waiting for an attack just isn’t the smartest course of action anymore, it would behoove you to run in and start swinging. You’ll have hordes of enemies on your back, so taking them out quickly is going to serve you a lot better than trying to parry everything. Enemies don’t take turns attacking in Syndicate, they all kind of just come after you, so if you play Syndicate the same way you did Unity, you’ll probably die pretty fast. It’s heavily focused on gang activities. Everything you do in this year’s Assassin’s Creed seems to be focused around increasing your gang’s influence. Yes, that’s right, the assassins are part of a London street gang. It’s weird to think that the ‘good guys’ could possibly the bad guys in this game, but last year’s excellent Rogue did a great job of making a templar likable, so why can’t they do the same with gangsters? Much of the marketing material currently out there for Syndicate mentions taking over London’s seven boroughs with the rest of your gang and gaining influence in the underworld of Industrial London. We know that growing your gang is going to be key to the story, we just don’t know to what extent, yet. You can hijack vehicles, GTA-style. As I mentioned earlier, London is full of carriages, trains and other vehicles. And for the first time in the series, you can drive them whenever you want. If you see an unattended carriage, feel free to steal it. See someone driving one? Rip ‘em out of the seat and steal it, too. Of course, it doesn’t just stop at stealing these things, you can engage in vehicular combat as well, and I mean more than just ramming people off the road. You can fight on the roofs of them and hop from one to another, killing its passengers or driver and taking it as your own. You won’t be taking them to Los Santos Customs or anything, but it’s a cool addition. Ubisoft took their lumps with Unity. It seems for the time being the studios under their control have shied away from the idea of adding multiplayer to Assassin’s Creed, choosing instead to focus on the single-player experience. If you were hoping for another co-op AC game, you might be waiting for a while. Yep. Thank you, six-pound-five-ounce baby Jesus. That’s about all we know right now. Or the abridged version at least, sans any story elements, of course. Between now and October 23, I’m sure we’ll get a ton more information. Syndicate checks a couple boxes on our Wish List from last December, and ignores a couple, but it’s shaping up to be an interesting game nonetheless. Assassin’s Creed Unity felt like a reboot of the series, which not everybody liked. So far Syndicate seems like Ubisoft is taking a mulligan on that reboot and attempting to deliver on their vision of a current-gen Assassin’s Creed. I’m cautiously optimistic, coming out of a fun demo last June at E3. What do you think, is Syndicate on your radar? Will it outperform Unity? Tell me in the comments! Steve Bowling is an aspiring freelance games journalist and critic. When he’s not playing games he’s building PCs to play them on. You can follow him on Twitter at@SteveBTAY , and you can read all of his articles here.